TZA-7000 is built for the toughest tours and high-profile installations, this amplifiers deliver superb concert sound in a rugged package that stands up to the rigors of the road. High-power designs drive your boxes as hard as you need to get full, clear coverage. Ideal for multi-speaker installations where a user needs to separately set power levels for two separate areas such as indoors & outdoors. ‘Stereo’ Music Operation for DJ programmes. 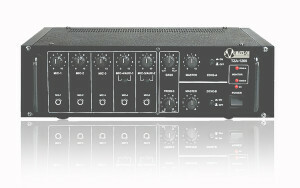 Facilitates connection and operation of two separate groups of speakers simultaneously on ‘Mono’ mode. Ideal for Places of Worship. TZA-5000 is built for the toughest tours and high-profile installations, this amplifiers deliver superb concert sound in a rugged package that stands up to the rigors of the road. High-power designs drive your boxes as hard as you need to get full, clear coverage. Ideal for multi-speaker installations where a user needs to separately set power levels for two separate areas such as indoors & outdoors. 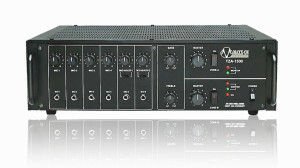 TZA-4000 is deliver superb concert sound in a rugged package that stands up to the rigors of the road. High-power designs drive your boxes as hard as you need to get full, clear coverage. Ideal for multi-speaker installations where a user needs to separately set power levels for two separate areas such as indoors & outdoors. TZA-2000 is ideal for medium sized installations such as in places of worship where two separate groups of speakers are needed to be connected. 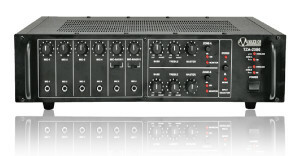 User has a choice to connect both the zones to 100V (LMT) type speakers, or 100V speakers to one zone and low impedance type speakers to the other zone. Both the zones can also be connected to low impedance type speakers. TZA-1500 is suitable for small sized installations such as in places of worship where both external and internal speakers are required to be connected with different sound level settings. User has a choice to connect both the zones to 100V (LMT) type speakers, or 100V speakers to one zone and low impedance type speakers to the other zone. Both the zones can also be connected to low impedance type speakers. TZA-1500 permits connecting 100V (LMT) type speakers to one Zone and low impedance type speakers to other Zone without causing overloading and overheating. Zone On/Off facility. Output levels of each Zone can be set independently to desired levels and the zones can be switched On/Off without disturbing the volume settings. TZA-1200 is suitable for small sized installations such as in places of worship where both external and internal speakers are required to be connected with different sound level settings. 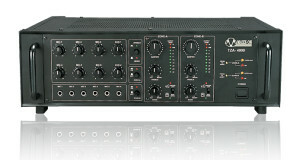 User has a choice to connect both the zones to 100V (LMT) type speakers, or 100V speakers to one zone and low impedance type speakers to the other zone. Both the zones can also be connected to low impedance type speakers. Connecting two groups of speakers, preamplifier output, bass and treble controls, zone On/Off facility, AC/DC operation have been provided.